What Exactly Are Bridge Loans? Buyers typically take out bridge loans so they can buy another home before they sell their existing residence. That might sound like an ideal solution, but it's not without risk. Bridge loans are popular in certain types of real estate markets but whether one is right for you can depend on several factors. Weighing the benefits and drawbacks of a bridge loan may help you decide if it makes sense for you. The buyer can immediately put her home on the market and buy without restrictions. 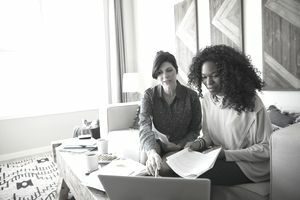 The buyer can remove the contingency to sell and still move forward with the purchase if she's made a contingent offer to buy and the seller issues a Notice to Perform. Not all lenders have set guidelines for minimum FICO scores or debt-to-income ratios for bridge loans. Funding is guided by more of a "does it make sense?" underwriting approach. The piece of the puzzle that requires guidelines is the long-term financing obtained on the new home. Some lenders who make conforming loans exclude the bridge loan payment for qualifying purposes. The borrower is qualified to buy the move-up home by adding together the existing mortgage payment, if any, on her existing home to the new mortgage payment on the move-up home. Many lenders qualify the buyer on two payments are because most buyers have existing first mortgages on their present homes. The buyer will likely close on the move-up home purchase before selling an existing residence so the buyer will own two homes for a hopefully short-term period. Lenders have more leeway to accept a higher debt-to-income ratio if the new home mortgage is a conforming loan. They can run the mortgage loan through an automated underwriting program. But most lenders will restrict the home buyer to a 50 percent debt-to-income ratio if the new home mortgage is a jumbo loan. Rates will vary among lenders and location, and interest rates can fluctuate. For example, a bridge loan might carry no payments for the first four months but interest will accrue and come due when the loan is paid upon sale of the property. There are also varying rates on different types of fees. Here are some sample fees based on a $10,000 loan. The administration fee is 8.5 percent and appraisal fee is 4.75 percent. Certain fees will be charged at a higher rate than others. In addition, there's typically a loan origination fee on bridge loans based on the amount of the loan. Each point is equal to 1 percent of the loan amount. If you don't have the cash and your existing home hasn't sold, you can fund the down payment for the move-up home in one of two common ways. You can finance a bridge loan or take out a home equity loan or home equity line of credit. In either case, it might be safer and make more financial sense to wait before buying a home. Sell your existing home first. Ask yourself what your next step will be if your existing home doesn't sell for quite some time. You'll be financially supporting two residences. If you're sure your home will sell or you have a plan in place in case it doesn't, the main advantage to a bridge loan is that it allows you to avoid a contingent offer along the lines of, "I'll buy your home if my home sells." Many sellers won't accept such a contingent offer in a seller's market. Having a bridge loan in place can make your move-up offer more attractive.